The Pointer Sisters have been on repeat in my head because, guys, after a long 5 months, our kitchen is DONE! Lord almighty was this a labor of love. We've never taken on a project this big before, and I was 8 months pregnant when we started, gave birth, and started caring for 2 under 2 so the majority of the credit goes to my handy husband Jake. We He DIYed every single part of this renovation except for installing the countertops. I couldn't be more proud of him and how it turned out. Should I stop talking and let the pictures speak for themselves? I have to apologize- I am the WORST at photographing interiors. Kitchens in particular. I don't know how you DIY bloggers do it!! My favorite part of the kitchen has to be this farm sink. It really is the sink of my dreams. Isla AND Sawyer have had baths in it, and strangely, it makes me actually want to do dishes! We had a debate for a long time over which type of faucet to buy, a pull down like you see here, or my dream bridge faucet that I thought would look absolutely stunning. Ultimately, function beat out beauty with 2 babies and we went with the pull down and it has been SUCH a game changer. I don't know that i'll ever go back to another type of faucet again. Our countertops are a white and dark grey quartz that I literally want to kiss every morning. I think they're so fresh and beautiful! I am such a germaphobe so I love that they show everything so I can make sure each day we start with fresh clean countertops. We also had quite a bit of debate over what to do with our backsplash. I hated the stone we had in here, and I really wanted to do something fun but ultimately we decided to go with a simple white subway because the countertops are so busy. I am SO glad we did. When the sun shines through the skylight the tile almost shimmers and it gives such a clean look. Jake took the backsplash all the way up this wall and built some floating shelves which made me swear I would marry him 10 more times I love them that much. This island was bare-bones and quite ugly if we're being honest, so we just added some trim around the edges and some fun farmdoor "x's" to jazz it up a little. It's painted a deep dark charcoal and I think the contrast is perfect in an otherwise very white kitchen. Since adding these barstools from Wayfair, Sawyer eats breakfast every day at the bar and I swear it's like he became a big-boy over night! I was so happy to say goodbye to the highchair until baby girl is on solids in a few months! All of the cabinets got a coat (or 5) of simply white by Benjamin Moore and it is AMAZING what a difference it made! Painting cabinets is such a labor of love. It takes forever but is always worth it in the end! New cabinets would have cost us 10,000+ dollars and we spent 100 total on paint, primer, and tools. Our new hardware was also a steal, I picked up a 50 pack from Amazon and the contrast against the bright cabinets is so pretty! Of course, once we finish one project in this house, it really highlights how many more there still are to do! Next up on the list is tearing up all of the flooring and replacing it with a luxury vinyl more suitable for kiddos and pets. The hardwoods in this house have really taken a beating and the carpets here are absolutely disgusting! I've literally dreamt of this kitchen FOREVER so it's a dream come true every time i'm in it. My Jacob did the most incredible job and I really have to give all the credit to him. Other than some painting and cleaning, this space was all him. My handy man! The before and after is mind blowing to me! 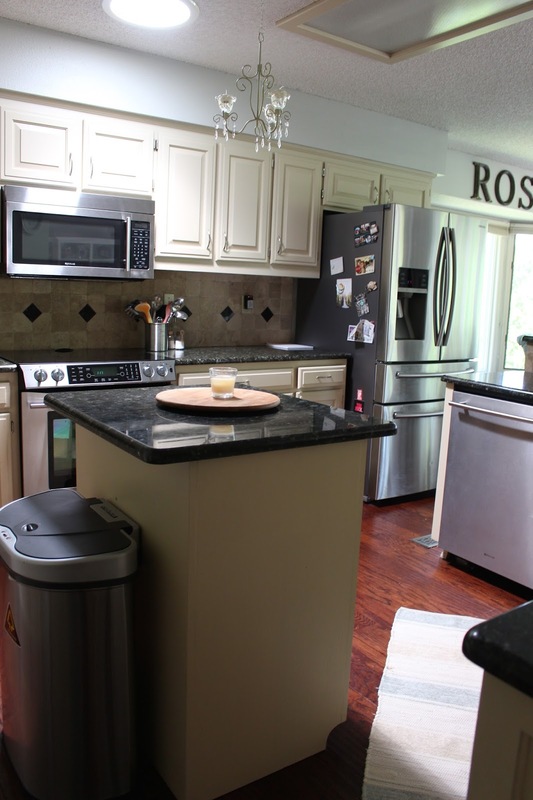 We were lucky to not have to change layout or appliances, which saved a TON of money. All in all, we spent about $6000 dollars on the entire remodel, the bulk of which being the countertops. I'm so glad we didn't hire out because it easily would have pushed the budget to over $10,000 and now we're able to use that savings for the next big project! Thank you so much for following along- if you have any questions, post them below! Beautiful! The white really opens up the space. Nice post. I learn something new and challenging on sites I stumble upon everyday. thesis writing service It's always interesting to read content from other authors and use a little something from their sites.